Transportation is the link between a people and the land they inhabit. It is the means by which we move ourselves, the resources we require, and the goods we produce. By overcoming the limitation of distance, transportation makes possible the many economic and social interactions that allow a community, a people, an entire culture, to thrive. Regardless of how we travel—whether on foot or horseback, by ship or rail, automobile or even airplane—it is the land beneath that is the common denominator of all transportation. Millions of years of geologic evolution have produced today’s Connecticut landscape: its north-south river valleys, its stony uplands, and its many harbors along Long Island Sound. This long evolution has affected the story of Connecticut transportation by influencing where people live and the uses to which they put the land. More specifically, the landscape’s physical characteristics, such as the slope of a hill or the location of a river crossing, have influenced where communities, past and present, have located particular transportation facilities, such as highways and railroads. For some 11,000 years humans have inhabited the areas now known as Southern New England and Connecticut. By the 1500s and 1600s, when European settlers arrived on these shores, indigenous groups had long made their living by hunting, fishing, gathering wild plants, and farming maize, squash, and tobacco. Transportation played an important role in the semi-nomadic life of these Native peoples, and an extensive network of overland trails crisscrossed the land. Though often no wider than a well-worn footpath, many Native trails defined travel corridors that remain important to this day, including the Bay Path from Hartford to Boston via Springfield; the Connecticut Path from Hartford to Boston via Manchester and Woodstock; and the Shore Path from New York to Boston along the shore of Long Island Sound. The tribes also built dugout canoes and timber rafts, which they used to cross rivers and coastal bays. English colonists brought with them a culture of land use that was radically different from that of the indigenous population. English colonists practiced subsistence agriculture, growing all of their own food, supplemented by the raising of domesticated farm animals. As the new colonists founded towns, one after another across Connecticut, the landscape changed dramatically. Forests that had stood for thousands of years were felled for timber; cleared fields were fenced in and put to the plow; and cattle, pigs, and horses were set to graze in open pastures. By 1800, the population of Connecticut had reached just over 250,000 people, who were almost exclusively English and scattered more or less evenly over a largely agricultural landscape. The ancient, first-growth forests that had covered most of Connecticut were nearly gone and so, too, the native black bear, white-tailed deer, wolves, and beaver that lived in that forest habitat. The English colonization of Connecticut was an ecological as well as a cultural turning point. A fundamental concern of both the Native groups and the English colonists was to feed and shelter a growing population using the limited resources at hand. The methods each culture used to accomplish that goal, however, differed greatly and proved to be a chief source of conflict between the European newcomers and the area’s first peoples. English settlers founded 100 separate towns during the colonial period and built a crude but passable network of dirt roads to accommodate travel within and between these towns. This network was comprised of three types of colonial roads: the private town way by which farmers traveled to and from their fields and woodlands; the public town way that provided townspeople access to the local church and gristmill; and the country way, by which colonists could travel from town to town. Colonists crossed the many rivers and streams in the colony using bridges and ferries, more than two dozen of each established during the colonial period. The most important country way in the colony was the Post Road from New York to Boston, which in Connecticut ran along the shore from Greenwich to New Haven, then north to Hartford and Springfield. Two additional post routes branched from this central spine: one across the eastern hills from Hartford to Boston via Manchester and Woodstock, and another along the shore from New Haven to Boston via New London and Providence. These three routes are referred to as the upper, middle, and lower post roads, respectively. It was along the lower post road that Sarah Kemble Knight made her adventurous journey from Boston to New York in 1704. Following the Revolution, the poor road conditions that existed in Connecticut, and the new nation generally, represented more than mere inconvenience. As the republic of 13 former colonies attempted to forge its own economy, the lack of adequate transportation was a very real threat to their continued union. With the national government divided by sectional rivalries, the states turned to the publicly chartered, privately owned turnpike corporations to provide for commercial and transportation improvements. The joint-stock corporation allowed investors to pool their wealth in manufacturing companies as well as services needed to foster commercial development, including banking, insurance, and turnpike toll roads and bridges. Connecticut chartered 120 turnpike corporations and constructed 1,600 miles of turnpike toll roads serving virtually every major highway corridor in the state. These dirt highways made personal travel easier and quicker and stimulated the growth of the carriage-making industry in the state. 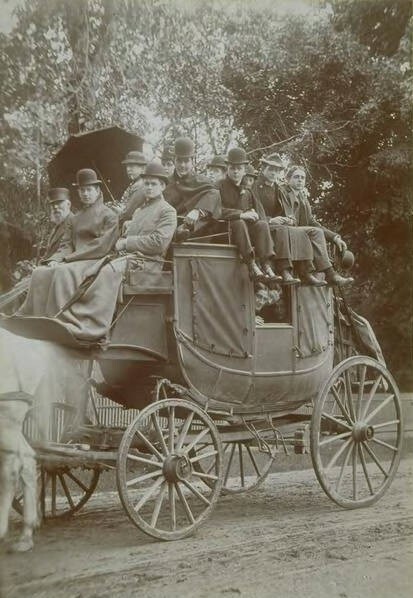 The turnpike network also made possible a thriving stagecoach industry that provided service to all the major population centers of the state and established Connecticut native Levi Pease as the most successful stagecoach entrepreneur in all of New England. Turnpikes and stagecoach travel created a degree of communication and mobility at a crucial junction in the nation’s history that might not have been achieved otherwise. In the early 19th century, with turnpike construction already underway around the state, the mechanization of production in Connecticut’s factory villages around the state dramatically altered the way that goods were manufactured. However, shipping heavy loads of manufactured goods long distances was not practical using horse-drawn wagons and dirt turnpikes. Following the success of New York’s Erie Canal in the 1820s, Connecticut and other states turned to the construction of inland canals to improve long-distance transportation. The most famous canal project in the state was the Farmington Canal, which ran from New Haven to Northampton, Massachusetts, and served the transportation needs of the Farmington Valley. But the canal era was short-lived. It was only with the arrival of the steam railroad that the full potential of the industrial revolution was unleashed. Between the opening of its first steam railroads in the 1830s and the completion of its last major rail lines in the 1870s, Connecticut constructed over 1,000 miles of steam railroad track that extended into every corner of the state. Well-known lines included the New York & New Haven and the Hartford & New Haven railroads, which together made up the first all-rail route between New York and Boston. Additionally, the Hartford, Providence & Fishkill ran across the state from Danbury to Providence via Hartford, and the Shore Line extended from New Haven to Providence along the route of the lower post road. Another popular route, the Air Line, crossed the state on a more direct route from New York and Boston via New Haven, Middletown, and Willimantic. By the turn of the century, Connecticut had become an industrial state with a population rapidly approaching one million persons. More than half of Connecticut’s residents now lived in one of a dozen urban centers around the state, including Bridgeport, New Haven, Waterbury, Hartford, and Willimantic. Working six days a week in noisy factories, many urban men and women made their living in one of the state’s many industries—all of which were now connected to a truly national economy, made possible by cheap and reliable rail transportation. As cities grew in size, the need arose for transportation within urban areas. Beginning in the 1840s, this need was met first with the omnibus, a horse-drawn, stagecoach-like vehicle that traveled a fixed route from one part of town to another. 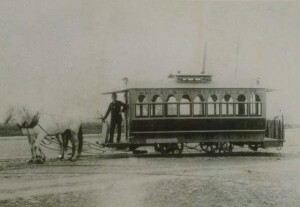 The omnibus was followed in the 1850s by the horse railroad, a horse-drawn streetcar that could carry more passengers by running the vehicle along steel rails. Within a generation, almost every city in Connecticut was served by one or more horse railroad companies. After the Civil War, the construction of electrical generating plants and the perfection of the electric motor for streetcar use by Connecticut native Frank Sprague allowed horse railroads to power their lines by electricity. Street railway lines were soon extended beyond city limits, making light rail travel possible between urban centers. By 1913, Connecticut had nearly 1,000 miles of street railways in the state, and it was possible to travel from New York to Boston via electric streetcar—in 20 hours! For a railroad like the New Haven, which derived much of its revenue from local passenger traffic, street railways had become an unwanted competitor. Beginning in 1903, Hartford native John Pierpont Morgan, a New York financier and member of the New Haven’s Board of Directors, conspired with the railroad’s president Charles Mellen to lease or purchase electric street railways in Connecticut, Massachusetts, and Rhode Island, as well as steamboat lines that operated on Long Island Sound, providing competitive overnight service to New York City. Within a decade, the New Haven was transformed from a railroad giant into a transportation monopoly whose combined railroad, steamboat, and street railway operations extended from Connecticut to Maine. Morgan’s transportation monopoly had come at a tremendous cost. The New Haven was now the parent corporation for some 300 subsidiary companies, and many of its purchases had been made using a financial sleight of hand that created the illusion of cash profits where none existed. As a result, the New Haven was vastly overextended and soon unable to meet the payments on its bonded debt. By 1914, for the first time in its history, the New Haven was unable to pay dividends to its stockholders. The New Haven under Morgan and Mellen had also become arrogant and ruthless in its business dealings, some of which involved barely disguised collusion and political bribery. 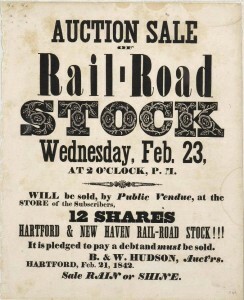 The New Haven monopoly soon drew the attention of the federal Interstate Commerce Commission, which investigated the company for anti-trust violations and forced the company to sell off many of its steamboat and street railway operations, as well as some railroad lines beyond Connecticut. But the debt of $200 million accumulated by Morgan and Mellen remained, and despite efforts to revitalize the New Haven during the 1920s, the railroad fell into bankruptcy in 1935. Land transportation in 20th century Connecticut took a bold turn in several ways from all that had come before. The invention of the internal combustion engine at the turn of the century revolutionized overland travel. Where land transportation for the past 100 years had focused on common carriers, such as the stagecoach, the railroad, and the street railway, land transport in the 20th century would emphasize auto mobility for both passengers and freight. Meanwhile, the monopolistic practices of railroads such as the New Haven had created a public demand for progressive reform, and future transportation improvements would be managed and financed by state and federal governments, not by private corporations. Auto mobility began, strangely enough, not with the automobile but with the bicycle. As was the case with many 19th-century technologies, the bicycle hailed from Europe but was soon improved upon and popularized by entrepreneurs in the United States. One of these men was Albert Pope, a Boston businessman who manufactured the first ordinary bicycles in the United States in Hartford in 1878. But the ordinary bicycle, with its over-sized front wheel and small rear wheel, proved difficult to ride for all but the most athletic of men. A decade later, Pope introduced the modern safety bicycle; its evenly sized front and rear wheels made it popular among both men and women. By 1900, Pope’s Hartford plant was producing 600 safety bicycles each day under the trade name Columbia. The bicycle contributed to auto mobility through the development of technologies like advanced metallurgy, variable speed transmissions, and pneumatic tires. Not surprisingly, the Duryea brothers of Massachusetts, who built and operated the first gas-powered automobile in the US on the streets of Springfield in 1893, and Henry Ford, who would mass-produce the automobile a generation later, both began their careers as bicycle mechanics. With the introduction of the horseless carriage, Pope began to manufacture a line of battery-powered electric automobiles in Hartford in 1903, and before long the Hartford-New Britain-Bridgeport area had become an important center of the emerging automobile industry. Ultimately, auto manufacturing shifted to the Midwest, and the pool of skilled mechanics that had been employed in making bicycles and automobiles in Connecticut began instead to build aircraft engines for Pratt & Whitney and other aeronautical companies in the 1920s. 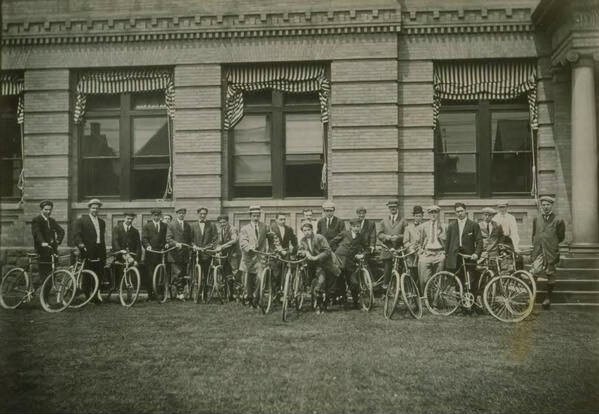 The bicycle craze also contributed to auto mobility through the formation of national cycling groups like the League of American Wheelmen and local riding clubs that together lobbied loud and hard across the nation for good roads. In 1895, Connecticut was the second state (after New Jersey) to form a highway department devoted to improving public highways throughout the state. By 1908, the Connecticut Highway Department had adopted a trunk line network of 1,000 miles of roads to be improved and maintained at state expense. As auto and truck traffic increased, roadway surfaces improved from crushed stone to cement and asphalt. The number of miles of state-financed highways grew as well. Soon the national government also became involved in highway building by designating a network of federal highways in each state and providing funds to the states to improve them. In addition to increasing traffic volume, additional problems faced road engineers. For example, the introduction of the high-compression gasoline engine made cars and trucks more powerful. To accommodate these faster vehicles, as well as to alleviate congestion on stretches of road where commerce was heaviest, engineers designed the limited-access highway. In place of a typical roadway 30 feet in width, where traffic moved at 15 to 20 miles per hour and access was available anywhere along the route, engineers conceived of a highway several hundred feet in width, where drivers were allowed to enter and exit only at certain points. This allowed traffic to move at 30 to 40 miles per hour or more. 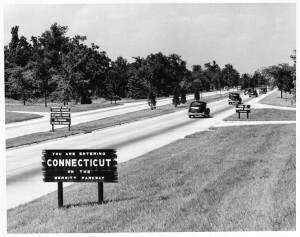 The first limited-access highway built in Connecticut was the Merritt Parkway, intended to ease congestion on the Post Road between Greenwich and New Haven by building a parallel highway for passenger cars only. 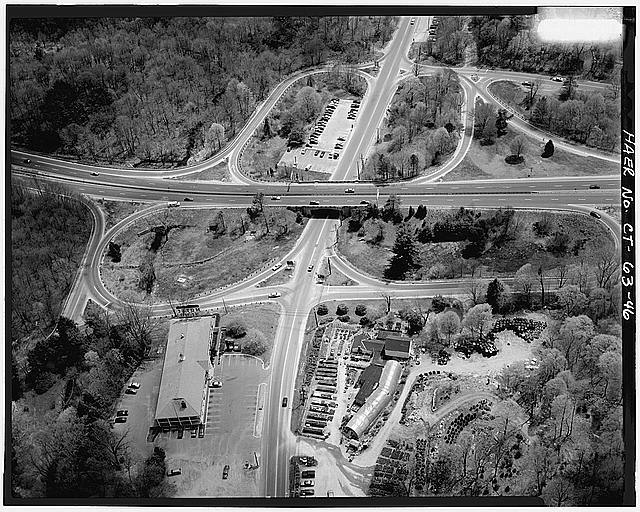 But traffic on both roads, the old as well as the new, continued to rise, and early in the 1950s, the state built another limited access highway in the same corridor, the Connecticut Turnpike, a modern express highway designed for speeds up to 60 miles per hour. In 1956, the federal government began funding for a national system of express interstate highways, and the pace of expressway construction accelerated. The federal interstate system in Connecticut included I-95 along the lower post route from New York to Providence; I-91 along the north-south portion of the upper post road from New Haven to Springfield; I-84 across the middle of the state from Danbury to Woodstock; and I-291, a circular route around Hartford intended to keep through traffic out of the city. At the same time, a network of state-funded expressways was built in other heavily traveled corridors in the state. Together, the state and federal programs would construct approximately 650 miles of limited access expressways in Connecticut. As expressway construction progressed during the 1960s, it became apparent the single-minded pursuit of auto mobility since the beginning of the 20th century had produced a severe transportation crisis. Air pollution, highway congestion, urban flight and suburban sprawl, and the demise of rail and bus transportation led to a growing nationwide awareness of environmental issues and sparked numerous protests against continued expressway construction. Government at both the federal and state levels responded to the problem by bringing the responsibility for all modes of transportation under public control and increasing funding for both rail and bus service. Since then, some improvement in the balance between transportation modes has been made, including a revitalization of commuter rail service from New Haven to New York, and bus service in many Connecticut cities. Yet public transportation in Connecticut today provides only a small portion of the state’s transportation needs. Connecticut remains a predominantly suburban state of more than 3 million people who are highly dependent on the automobile for personal travel and on the trucking industry for the pickup and delivery of local and interstate commerce. Richard DeLuca is the author of Post Roads & Iron Horses: Transportation in Connecticut from Colonial Times to the Age of Steam, published by Wesleyan University Press in 2011. Griswold, Hayden L., and Mathias Spiess. “Map of Connecticut Circa 1625. Indian Trails, Villages, Sachemdoms.” 1930. University of Connecticut Libraries, Map and Geographic Information Center - MAGIC. Link. “Map of the Railroads of Connecticut to Accompany the Report of the Railroad Commissioners, 1893.” Hartford, CT, 1893. University of Connecticut Libraries, Map and Geographic Information Center - MAGIC. Link. Whittlesey, Charles Wilcoxson. Crossing and Re-Crossing the Connecticut River; a Description of the River from Its Mouth to Its Source, with a History of Its Ferries and Bridges. New Haven, CT: Tuttle, Morehouse & Taylor Company, 1938. Connecticut. State Highway Department. Forty Years of Highway Development in Connecticut, 1895-1935. Vol. 46. New Haven, CT: Tercentenary Commission of the State of Connecticut, 1935. 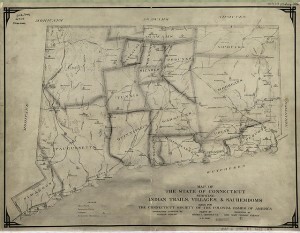 Mitchell, Isabel S., and Tercentenary Commission of the State of Connectict. Roads and Road-Making in Colonial Connecticut. New Haven, CT: Yale University Press, 1933. Radde, Bruce. The Merritt Parkway. New Haven, CT: Yale University Press, 1993. Holbrook, Stewart Hall. The Old Post Road: The Story of the Boston Post Road. New York: McGraw-Hill, 1962. Karr, Ronald. The Rail Lines of Southern New England: A Handbook of Railroad History. Pepperell, MA: Branch Line Press, 1995.